Hear me out. Give me a chance. Let’s go back to the beginning, forget my conclusion, and just follow me on my journey. First look at f68v3, once famously (and wrongly) identified as the Andromeda Galaxy by Newbold. Well I don’t blame him, it has spirals and stars. Figure 1. Round diagram on f68v3. The Andromeda Galaxy doesn’t look like that and a drawing of a galaxy wouldn’t make sense in the historical context. So we know it’s a coincidence, and we can find single coincidental matches everywhere in the manuscript. But what if we found two, or three, or four, or more? It would get more and more suspicious and we would have to consider it. Four arms, which is actually quite rare. Note that while there appear to be eight spiral arms, only four arms originate from the starry area; the other four originate from the Galactic Centre and thus cannot really be galactic spiral arms. But I’ll get to that later. Figure 2. f68v3 diagram with galaxy structure indicated. Click on image for larger size. 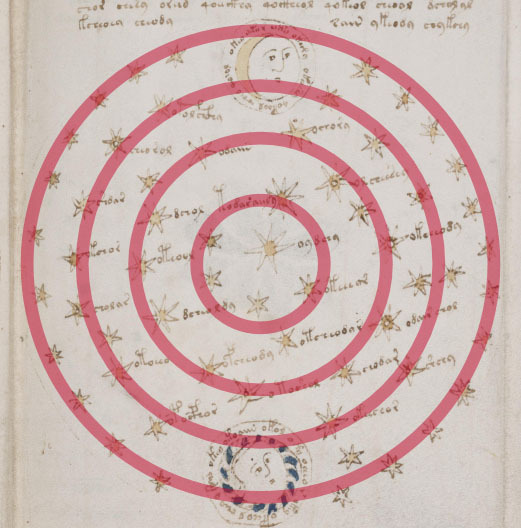 Seasoned Voynich Manuscript experts will roll their eyes and expect me to identify it some matching galaxy out there, like so many other amateurs. “Of course you can find something similar, there are billions of galaxies!” No, I just looked at one possibility, because it’s labelled. The T/O map in the middle is an abstraction for Earth. So the galaxy is ours, the Milky Way. And what is our galaxy shaped like? Circular grand design spiral galaxy with four arms (Urquhart et al., 2013). In the centre is a supermassive black hole, around that is the main halo of stars, then a gaseous halo, and finally a dark matter halo at the circumference (Law, 2010). Figure 3. Diagram of the Milky Way and distribution of luminous matter. Blue and red dots are star clusters in the original diagram. Galaxy structure indicated in overlaid yellow labels. Note that while the spiral arms seem to turn the opposite way from f68v3, a clockwise spiral will appear anticlockwise if seen from the other side, and vice versa. 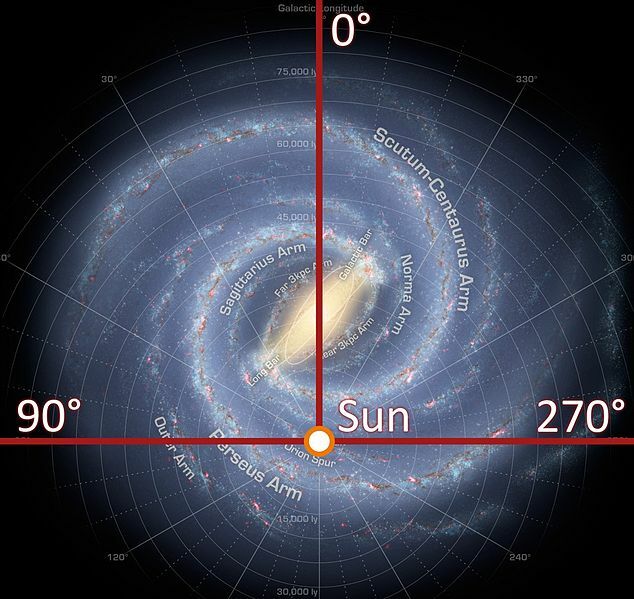 This diagram shows the Milky Way from above the North Galactic Pole but there is no true “up” or “down” in space so the view of the galaxy from the other side (i.e. from below the South Galactic Pole) is just as valid. Click on image for larger size. “Haha very funny Brian,” I thought. There are obvious, obvious problems. It doesn’t make sense as an observation in any historical era, let alone the 15th century. We’ve never been able to take a photo of our own galaxy (naturally enough, after all we’re inside it). We have measurements, estimates and simulations so we know roughly what it looks like, but the information was only available in the 1990s. There was simply no way to fit it into the medieval time period, no matter how sophisticated or genius. So I just ignored it until something later hit me, and it all fell into place. Figure 4. Galactic quadrant diagram. In the “galaxy” on f68v3, each sector of the halo has five stars, except the left sector, which has an extra star. It is located in exactly the same place as the sun would be in a modern diagram of our galaxy. And the kicker? The crease forms a line of the galactic quadrant system. Figure 5. f68v3 diagram with sun and galactic quadrant indicated. So we have something that would not just be a depiction of the same natural phenomenon, but also has the same modern human convention that we use. It’s almost like one diagram was made using the other! Overlapping the pictures again, the areas don’t just match, they have the same size and proportions. 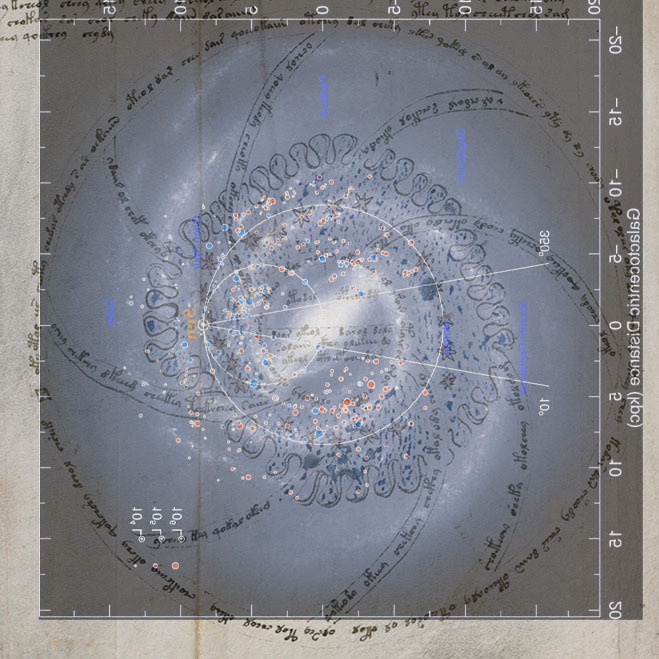 Figure 6. f68v3 diagram with overlaid galaxy diagram (rotated and flipped to show the view from the South Galactic Pole and the sun on the left hand side). Notice the location of the sun matches the extra star in f68v3’s star halo, the longitude line would coincide exactly with the crease, and the distribution of luminous matter matches the size of f68v3’s star halo. Call it paredoilia, but there are too many coincidences, every single area and feature matches. I was concerned. It didn’t make sense. I tried to ignore it, surely I’m just misidentifying something? But I realised the only thing flawed was my assumptions. Take for example the Vinland Map which purports to be from the early medieval era, and has the carbon dating and style to match (Donahue, Olin, & Harbottle, 2002), but accurately depicts coastline of northern Greenland only known and mapped in the 20th century. Nobody tried to shoehorn the discovery into a Viking-era time frame, they just dealt with the evidence as-is and concluded it was a modern hoax. If a source of information has knowledge from a certain time period, it can only exist in the time of its discovery or later. Period. If it has an anachronistically modern image, it must be modern. Full stop. 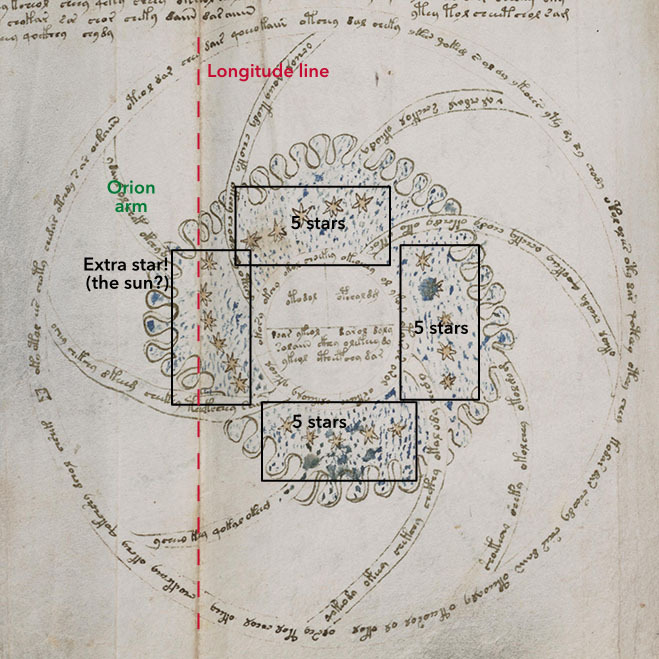 So why would I try to explain away the Voynich Manuscript’s galaxy and co-ordinate convention as something depicted in the medieval era? Critics would say “how is this possible? With that level of knowledge it has to be from the 1990s!” and I would just try to rationalise why we might see it earlier. But then I just succumbed to the obvious. If it “has to” be from the 1990s…then it is. Figure 7. Flawed photograph of the star Melnick 34. Figure 8. Round diagram on f69r. Here’s how the features match up. Similar, no? It’s even to scale! Figure 9. Flawed Melnick 34 photograph compared with round diagram on f69r. Independent observers have noted that the manuscript may depict a stylised supernova (Steve D. et al., 2015). Appropriately, one of the first achievements of the Hubble Space Telescope was finding data on Supernova 1987A (Amazing Space, 2010). 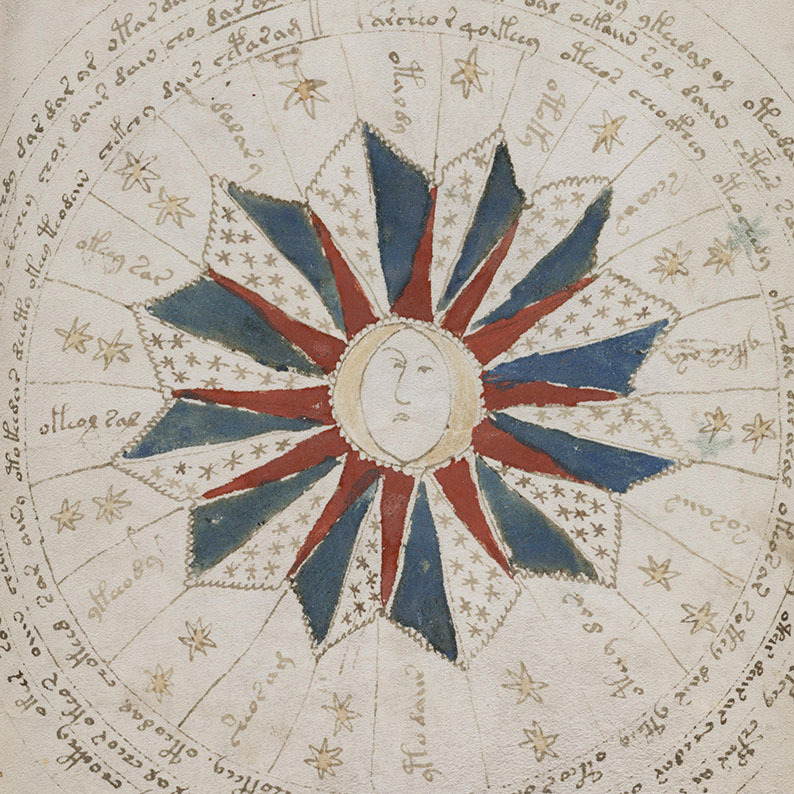 Figure 10. f67r1, a candidate for a stylised supernova in the Voynich Manuscript. Figure 11. Stars on f68r2 with concentric ring arrangement shown in red. Figure 12. 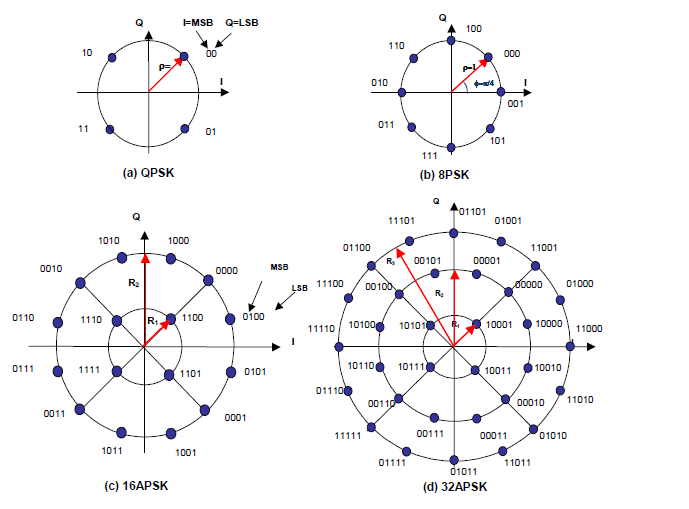 DVB-S2 modulation constellations for satellite communications. “What is your background? 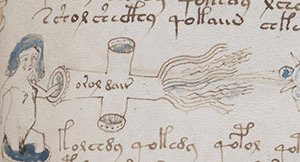 I studied Aeronautics and Space Engineering at the Technical University in Delft, the Netherlands, and have obtained both a Masters degree and a Ph.D. on the topic of precise orbit determination of artificial satellites.” – René Zandbergen, Voynich Manuscript expert and administrator of voynich.nu (Zandbergen, 2015a). René Zandbergen was born in Schiedam, Netherlands, where he attended primary and secondary school. He excelled at mathematics and physics and even placed highly in the Mathematical Olympiad. He studied Aeronautics Engineering at the Delt University of Technology (also in the Netherlands) where he specialised in artificial satellites, orbital mechanics, computation and altimetry. Along the way he visited CNES in France and Goddard Space Flight Centre in Houston, USA. After graduating, he worked with the European Space Agency on ERS-1 and EURECA. Since 1989 he has been based in ESOC, Darmstadt, Germany (Zandbergen, 1990). He entered “Voynichology” in the early 1990s and helped to set up the mailing list. 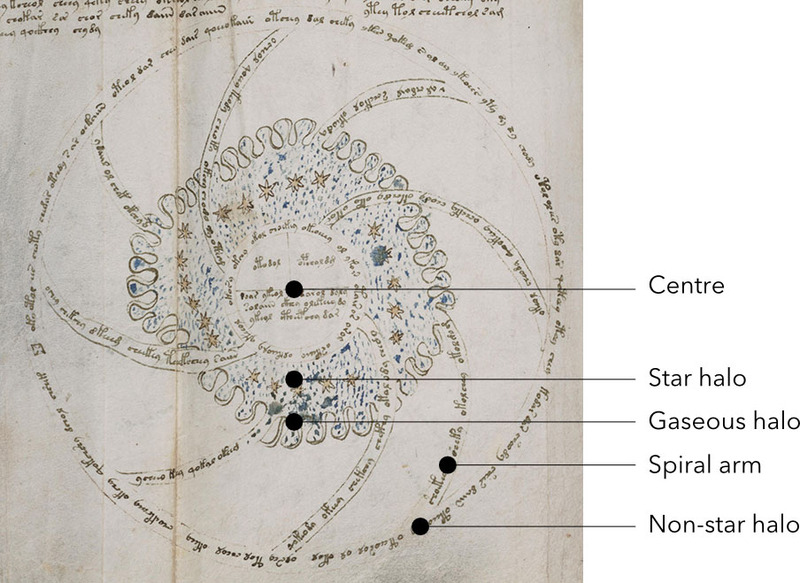 Has been researching since, and runs the popular site voynich.nu (Zandbergen, 2015a). We will see the legacies of these as we investigate further into the manuscript. 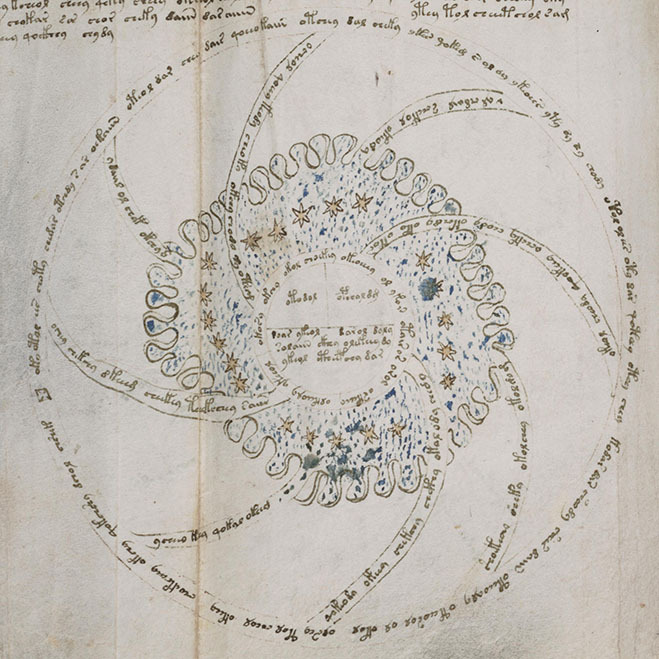 Much of the mysterious imagery in the Voynich Manuscript becomes apparent when we know where to look. It is refreshing how obvious it is now, it almost makes me wonder how I didn’t notice it before! Whether fake or real, we know that creative minds draw inspiration from their surroundings and what they are familiar with. Sometimes they include them deliberately as references. That said, let’s go on a tour of prominent features in Darmstadt and the landmarks of the Voynich Manuscript, and you will see some eerie similarities. First consider the rosettes page and pharmaceutical section. The centre rosette has some strange pointed dome structures which also resembles some of the jar shapes. We can find the inspiration easily in Darmstadt. Figure 13. Comparison of round pointed structures. Left: Part of Darmstadft Artists’ Colony. Centre: “Domes” in centre of rosette page. Right: “Jar” on f89r2. Next consider the balneological section. Why are the baths green? Like any other forger, Zandbergen could not resist the habit of drawing in influences from his immediate surroundings. But alas, in the modern era we can find photos on the internet and expose these little slip ups. Figure 14. 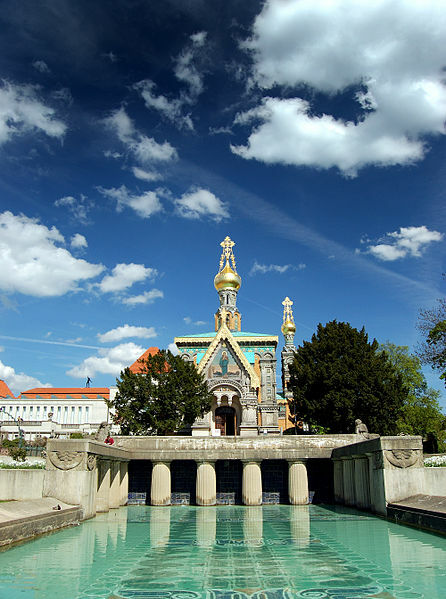 Russian Chapel in Darmstadt. Note the green pool. Figure 15. 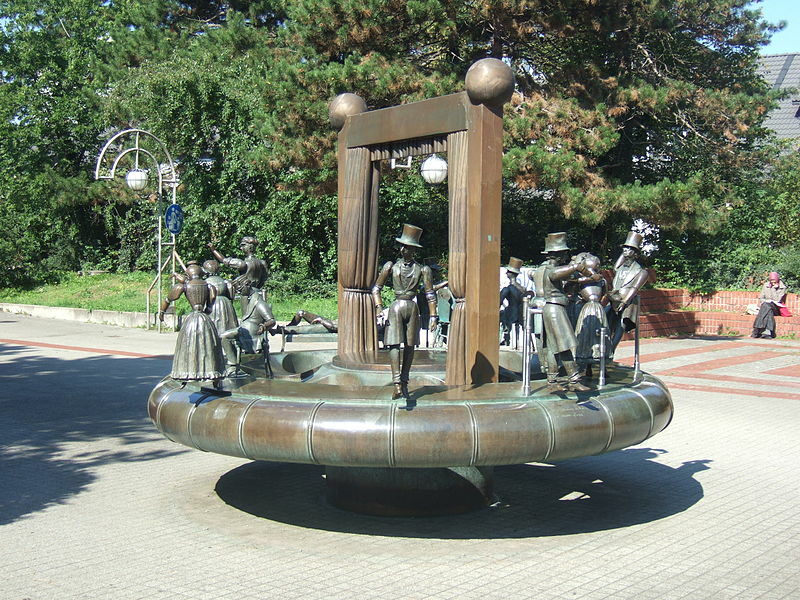 Datterich Fountain in Darmstadt. Some may object, a person would view the fountain from the side, and it would not look like a ring of people. To get that view that you’d have to see it from above. Yes, but think about it: to see it from above, where would you have to look from? Space. And Zandbergen is a satellite expert. Checkmate. Speaking of space views, some have speculated that a few of the plants look totally unreal and these may be fabrications hiding other visual information. We can see this obviously in f11v’s plant which corresponds with a space view of southern Darmstadt. Figure 16. Left: Satellite view of southern Darmstadt. Right: f11v’s plant. Centre: Both images superimposed. So all of these features can match with places in his vicinity, hinting at inspirations for the imagery of the Voynich Manuscript. Also isn’t it suspicious that if he is in Darmstadt and saw these similiarities, he never mentioned them to the community? Is he hiding something? Of course you may object to my matches, but then you must point out a city that fits better. I think you cannot, this is the best fit on all counts. But feel free to try. Like many other inventors, he may have also secretly included his machines as a tribute or reference. What is something in the manuscript that may qualify? The pharmaceutical section is almost consistently full of plants and jars, but one object stands out as nonsensical. 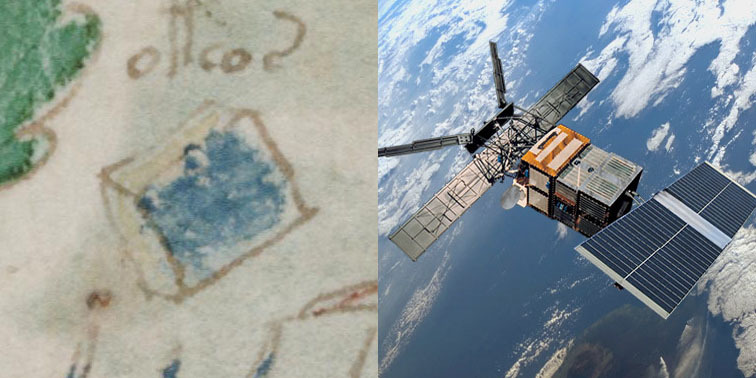 The top of f102v2 has a cube (a shape too geometric to be a plant part) with two gold faces and one blue face. Could this be a satellite that Zandbergen has worked on? Figure 17. Left: Unknown cube on f102v2. Right: ERS-1 satellite. The ERS-1 satellite is a stunning match. The main body is a cube and consists of the colours gold and blue. The cube on f102v2 does not have the solar panels, but this may be because it is showing the prototype stage. To conclude the matches with Zandbergen’s life, let’s investigate the use of hidden heraldry in the manuscript. The premise is that heraldic coats of arms were hidden so that the casual observer would not recognise the patterns, but those familiar with them could. Often cited examples include the eagle in the roots of f46v and the four-legged animal (almost always interpreted as a lion) in the roots of f99v. Figure 18. Hidden eagle in the roots of f46v. Figure 19. Hidden lion in the roots in f99v. There are other strange shapes and items throughout the manuscript that may be relevant, but it stands to reason that only the most prominent ones are the most important. So what is the biggest? Look no further than the cross on f82r, which is even larger than a person. Figure 20. Large cross on f82v. A splayed eagle, a lion and a cross. What do these form? 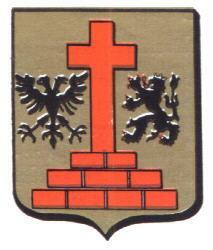 None other than the coat of arms of Zandbergen! Figure 21. Coat of arms of Zandbergen. At this point I stress again, you are entitled to your own opinion and you may disagree if you want. But those intelligent and open-minded enough to see the obvious links will now be curious to know why René Zandbergen created this manuscript. What is the text and what does it say? The “correct” answer is that there is no scholarly consensus and it could be anything from cipher to gibberish. But the reality is that people have been able to read it before, but we dismissed because we tried to force it within our conceptions and dismissed it when it didn’t work. You know it to be true, even if you don’t want to admit it. We have to clear away assumptions and just work with facts, not biases. The truth of the matter is that the manuscript has made perfect sense to those who have taken something like a tab of LSD. These users report a sense of revelation and they have mentally “unlocked” the manuscript. Yet we suppress it because of the taboo nature of drug use and our prudish sensibilities. Unfortunately this has held us back from appreciating the true genius of the cipher, as it cannot be cracked by conventional cryptography or computers, only by those in a chemically induced state of mind. But what information is it hiding? We already have a clue, and investigating the list of plant identifications confirms this suspicion (Steve D., 2015). Figure 22. Left: f1r. Right: Claviceps purpurea (ergot), a psychoactive substance. Figure 23. Left: Top of plant on f1v. Right: Atropa belladonna (deadly nightshade) which can be used recreationally. Figure 24. Left: Plant on f16r. 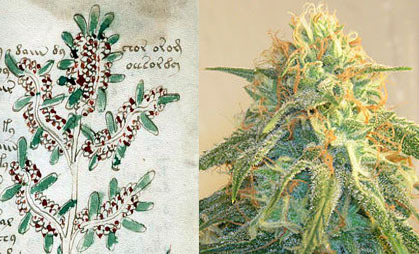 Right: Cannabis sativa (cannabis, marijuana). Figure 25. Left: Leaves on plant on f36v. Right: Cannabis sativa (cannabis, hemp) leaves. Figure 26. Left: Bulbous structure on plant on f90r1. 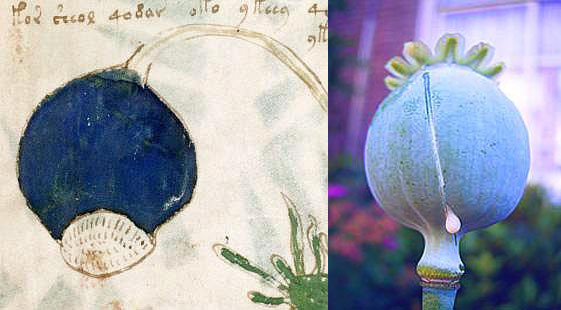 Right: Paper somniferum (opium poppy). Figure 27. 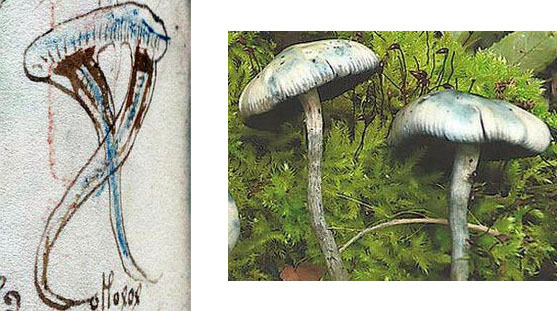 Left: Blue mushrooms in f99v. Right: Psilocybe serbica (European psilocybe, psychedelic mushrooms). There is a strong theme here. 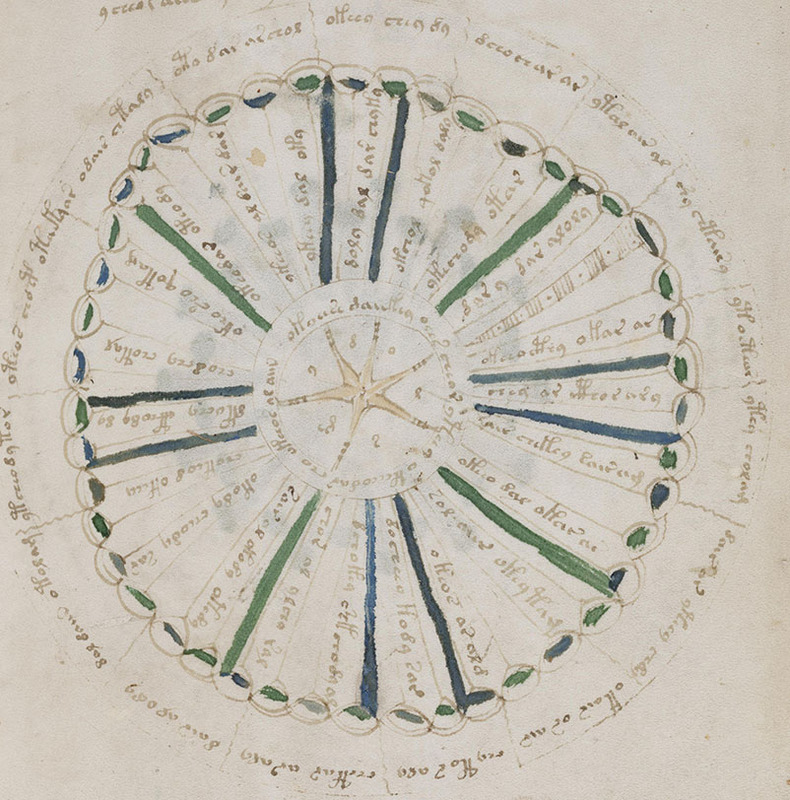 Could the Voynich Manuscript be a manual for recreational drugs? It would fit the contents greatly. There are a great deal of pages on plants, and many of those parts end up in the pharmaceutical section where they are chopped up and subject to recipes. Some have suspected that the balneological section describes alchemical processes like distillation; could this be part of the drug manufacturing process? Finally the remaining portions of the manuscript may describe what the user should expect, i.e. mind-blowing visions of colourful circular patterns, “seeing stars” and nymphs as hallucinated spirits. All of the strange features of the manuscript, every single page, explained in one fell swoop! The theory is not only consistent with the contents, but also the historical context. Many recreational drugs have been legalised in the Netherlands since 1976 (MacCoun & Reuter, 1997), a liberty which is not present in most other countries. This became all too apparent in 1989 when the United States invaded Panama and overthrew its government to combat drug trafficking. Given the escalating use of force in the War of Drugs, how could someone from a drug-tolerant society spread the joys of getting high without drawing the attention of law enforcement? It is around this point that René Zandbergen must have concocted the brilliant idea of making drug-growing instructions under the guise of an unreadable medieval document. This document would be self-perpetuating because of how mysterious the manuscript is, and it would use the new international medium of the internet. The perfect way to send illicit information worldwide in plain view! So in the early 1990s this genius created the manuscript that we all know and love to this day, using little decorations and in-jokes from his life and astronomic profession. Then through his contacts (remember, his background was in maths and physics) he innocently presented the manuscript to Jim Gillogly, who was always keen for the cryptographic challenge. But alas, he was a sober individual and did not come close to the secret of unlocking the text. As expected, he sought other interested individuals over the internet with a mailing list, and the rest snowballed from there. For you see, your source of information is the very man who duped you in the first place! Who has even read the original books? Nobody, we just look everything up on voynich.nu and trust its references. This creates a cycle where everybody trusts the information because other reputable sources have cited it. 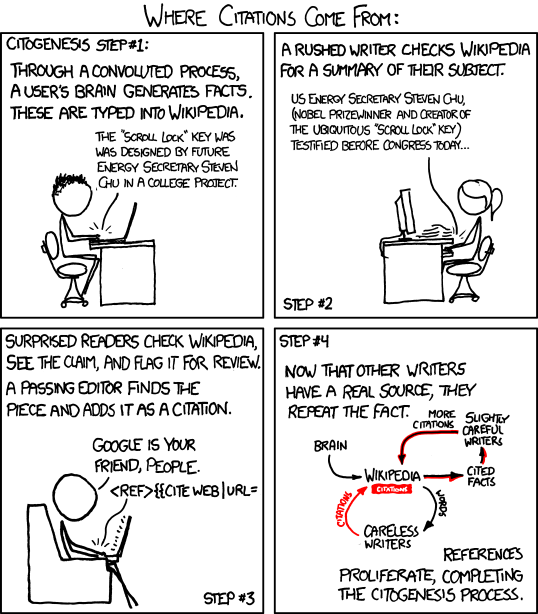 This process is analogous to the comic below, just replace “Wikipedia” for “voynich.nu”. 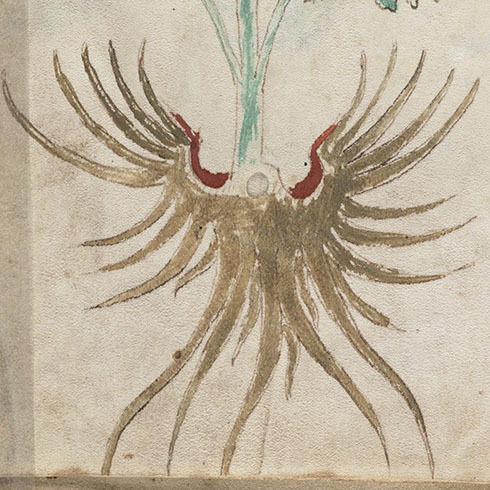 Wilfred Voynich? Spotty record, never existed. Newbold? Invented for astronomy in-jokes. Kraus, Friedman and Tiltman? Real people but linked to increase the manuscript’s value. D’Imperio’s report? Real ISBN of unpublished NSA report, but database contents hacked using his satellites. 1665 Baresch letter? Discovered by none other then… you guessed it, René Zandbergen. Nobody was with him and nobody had ever seen it before. Suspicious. Logically he was the one who had created it and placed it in the archive. Where the symbol that looks like an “8” is actually “ß”, the German ligature for “sz”. The four dots above the final “O” mean the fourth letter, to hide an extra “D”. So once we rearrange the letters, we can see the colophon from Rene written in German! ICH LIEBE MARIHUANA, OPIUM IST SPASZ AUCH. POSITIV BIZARR. RATSAM. AHA IOLO CDXX FLAMME ES. I LOVE MARIJUANA, OPIUM IS FUN TOO. POSITIVELY BIZARRE. RECOMMENDED. AHA YOLO 420 BLAZE IT. Before I make some summarising remarks, I will address some questions that readers have brought up about my theory. Your whole theory rests on the galaxy identification. Why include that in a drug manufacturing document? And what about the other four arms in f68v3’s galaxy diagram? Again this is where Newbold’s Roger Bacon story is an appropriate reference. You see, the early 1990s had scientific debate over “dark matter” which had gravitational effects but was completely invisible. 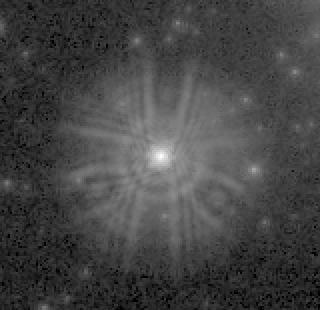 f68v3 has are four regular arms stemming from the starry area, and four extra ones connected to the supermassive black hole in the centre. What are black holes known for? Gravity. What is dark matter known for? Also gravity! So the page contains Zandbergen’s hypothesis on the matter (excuse the pun), which is that the galaxy has extra arms made of invisible dark matter. What of the scientific testing that places the manuscript in the 15th century? In your naivety you have been gullible and not noticed the glaring omission on Zandbergen’s website. What does he say about the 2009 McCrone analysis? At no point does he mention that he was actually there, as you can see in the photo below. Figure 30. René Zandbergen in the lab with Dr. Joe Barabe. If it would be against his interests to reveal that he was there, what would he be hiding? We can find the answer in the Archaic Mark, another artifact that was analysed there contemporaneously. So if he didn’t want anybody to look into his time at the analysis, there is only one simple explanation – he swapped the samples of the Zandbergen Manuscript and the Archaic Mark. So you think you have cornered me, that you have put me in a tight spot with this hard scientific “proof”, but no. You have only strengthened my position because the tests do not suggest a 15th century origin. That was actually for the Archaic Mark. Instead the science concluded that the Zandbergen Manuscript is a modern forgery! René Zandbergen is trustworthy. Why would he do this? That is a myth and a delusion. The truth is right in front of you, he has stated one thing and the photo shows another, so he must be hiding something. If you do not see the obvious then I feel sorry for you, but it is your loss if you want to be wilfully ignorant. You are free to interpret the facts any way you want but you cannot just deny the ones you don’t like. You are entitled to your own opinions. You are not entitled to your own facts. Aren’t you nitpicking a very small detail in how his text is worded? No, I’m reading his intentions. All avenues must be explored and if a detail is significant or suspicious, it is important to take the time to look into it. You are limiting yourself to the ideas that you were already comfortable in, trapping yourself in an ideological box whilst others make way with real exploration. Why do you think René Zandbergen is a druggie? He’s Dutch, of course he takes drugs. HEY, you didn’t answer the actual concern. HEY, of course I didn’t. To receive a logical response you must first provide a logical statement. You didn’t make any reasoned point about the arguments in my theory so I dismissed your inane comment. Be glad that you received any response at all. How could Zandbergen make such an authentic looking manuscript in the modern era? Blank vellum! Blank vellum!! Blank vellum!!! But some of the plants identified in the Voynich Manuscript aren’t psychotropic. How do you explain that? Yes but some of them are, as I have demonstrated. What’s your point? That MOST aren’t psychotropic, and a book containing psychotropic drugs should have mostly psychotropic plants instead of the other way around? What you have just said is one of the stupidest things I have ever heard. At no point in your rambling, incoherent response did you come close to anything resembling a rational thought. Everyone here is now dumber for having read it. I award you no points, and may God have mercy on your soul. Like so many others, you take a strawman caricature of my theory and do not acknowledge the real points I have made. If you had taken the time to actually read my theory, you would know that I did not claim the plants are all psychotropic. Instead the book is about how to make psychotropic substances from plants, which may or may not be psychotropic to begin with. I have also pointed out that some plants are artificial and hide other visual information. But I get that the ideas are too unpopular for you, so you do not wish to engage with the theory in an honest fashion and you resort to strawman arguments. Very well, if you feel that way then I am happy for you to leave. But while you are here, let me enumerate a list of your faults. You do not think for yourself. You just blindly follow the crowd and dogpiling on those who go outside the community consensus using strawmen. You present strawman arguments and sophistry in lieu of proper logical rhetoric. You cannot take criticism, lashing out with strawmen when others demonstrate a fault in your statements. You do not converse with others in a respectful manner. Instead you stoop low and speak with insults and strawmen. Thank you for taking the time to provide me with a profile of the type of person who likes to belittle my theory with strawman arguments. Although I do not appreciate such nonsense filling up my inbox, it gives me vindication to know that the criticism is fuelled by childish foolery and nobody has real intellectual counterpoints to make against my theory which still stands as a rock. René Zandbergen created the manuscript from 1990-1991 as a way to distribute drug growing information over the internet under the guise of a mysterious medieval manuscript. The Zandbergen Manuscript’s contents are about growing plants, processing them into drugs, and what to expect when you take them. These diagrams are decorated with artistic influences from his surroundings and astronomy in-jokes. One page contains his hypothesis on dark matter distribution in the Milky Way. Because of the strong astronomic influence, the burden of proof is on those who believe the manuscript dates from before the Hubble Space Telescope launch on 25 April 1990. Zandbergen fooled Jim Gillogly into setting up the mailing list, giving the impression of independent creation. He also created a whole fake provenance with the information on voynich.nu and the letter planted in the archive. 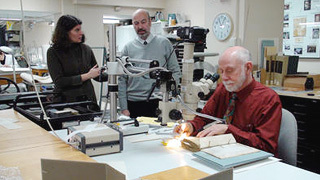 In the 2009 scientific testing, Zandbergen swapped the samples to make it appear that the manuscript is from the medieval era. It is now clear to me that many don’t believe the truth because they don’t want to. They have a vested desire to see the Zandbergen Manuscript as a romantic, historical, mysterious book from the 1910s or before. But I do not worry about what people believe, the truth is the truth and I will pursue this truth for as long as it takes. In this moment, I am euphoric. Not because of any phony expert’s blessing. But because, I am enlightened by my own intelligence. Block, D. L., Puerari, I., Stockton, A., & Ferreira, D. (2000). Towards a New Millennium in Galaxy Morphology. Dordrecht, Netherlands: Springer. MacCoun, R., & Reuter, Peter. (1997). Interpreting Dutch Cannabis Policy: Reasoning by Analogy in the Legalisation Debate. Science, 278(533), 47-53. Urquhart, J. S., Figura, C. C., Moore, T. J. T., Hoare, M. G., Lumsden, S. G., Mottram, J. C., Thompson, M. A., & Oudmaijer, R. D. (2013). 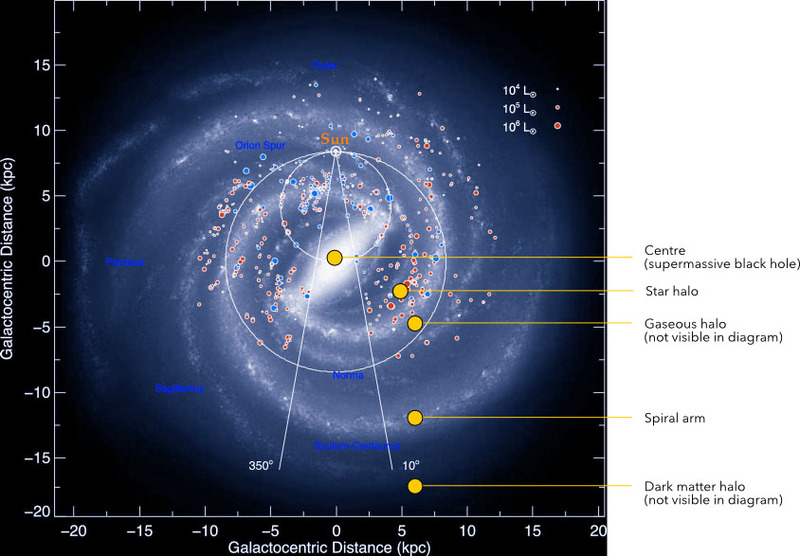 The RMS survey: galactic distribution of massive star formation. Monthly Notices of the Royal Astronomic Society, 437(2), 1791-1807. Zandbergen, R. C. A. (1990). Satellite Altimetry Data Processing: From Theory to Practice. Doctoral thesis, University of Delft, Delft, The Netherlands. 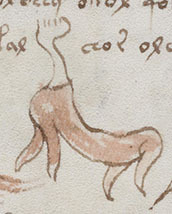 All Zandbergen Manuscript images courtesy of the Beinecke Library. Figure 3: Urquhart et al., University of Leeds. Figs. 4, 7, 17 right: NASA. Figure 12: Joshua Kline, University of Colorado. Figure 13 left: Orikrin1998 on Wikimedia Commons. Figure 14: Till Dettmering on Wikimedia Commons. Figure 15: Clemensmarabu on Wikimedia Commons. Figure 16: International Space Station. Very well done. I am now even less sure than I was before that Rene has nothing to do with it. Shocking results… But the nice side of it is that now that the mystery of the VMS is unveiled, we can switch our effort over to other stuff, like e.g. Dorabella cipher. A day of great relief to all the VMS research community (except Dr. Zandbergen, of course). Oh dear – this is so plausible. Might take a while to trash all my own stuff, so count me converted …. as of April 31st. Hi – This lovely tongue-in-cheek post contains so much information not found elsewhere. 🙂 I just want to check that the biographical details given for Rene are not part of the spoof, but literally true. I notice for example that no year of birth is included, as is routine for biographies. Thanks. I’d have left a message at voynich.nu but find no means to do that. Cheers.